Here it is - the most economic yet powerful pop-up display for trade shows on the market. This EZ 6' table top trade show display comes complete with a full set of photomural graphic panels for an impressive and eye-catching effect. Two halogen lights are included to highlight your custom graphics, and the padded carrying bag makes transporting this pop up display to and from trade shows quick and easy. When attending a trade show or convention a portable booth to display your company's message is key. 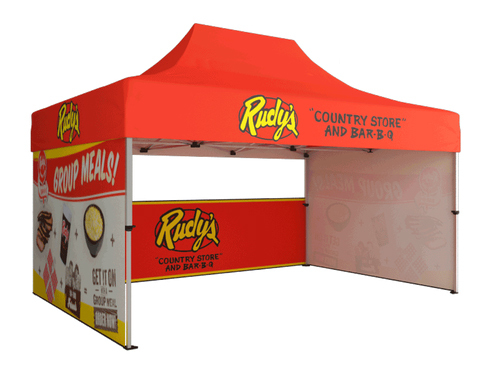 With its lightweight yet sturdy design, the Pop-Up booths from Display Overstock are perfect for you. These displays can be customized with graphics and text so you may exhibit the types of services and/or items you company sells or buys. Let us help you pick out and design the best one for you!